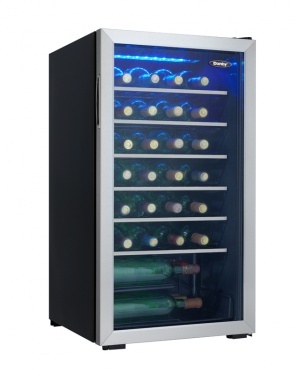 Your growing wine collection will feel right at home in this classy free-standing wine cooler from Danby. There’s plenty of room for your favourite wines to chill and age in this stunning unit as it can easily hold up to 36 bottles. The beautiful blue LED track lighting system will showcase your impressive collection without the need of a warm incandescent bulb. The stylish appliance is designed to integrate seamlessly into your home’s interior surroundings wherever you decide to place it. The creative lighting system and beautiful tempered-glass door ensures the cooler is energy-efficient at all times and harmful ultraviolet rays are kept at bay. It comes with a convenient temperature range of 6°C to 14°C (43°F - 57°F) to make sure your bottles are always perfectly chilled. 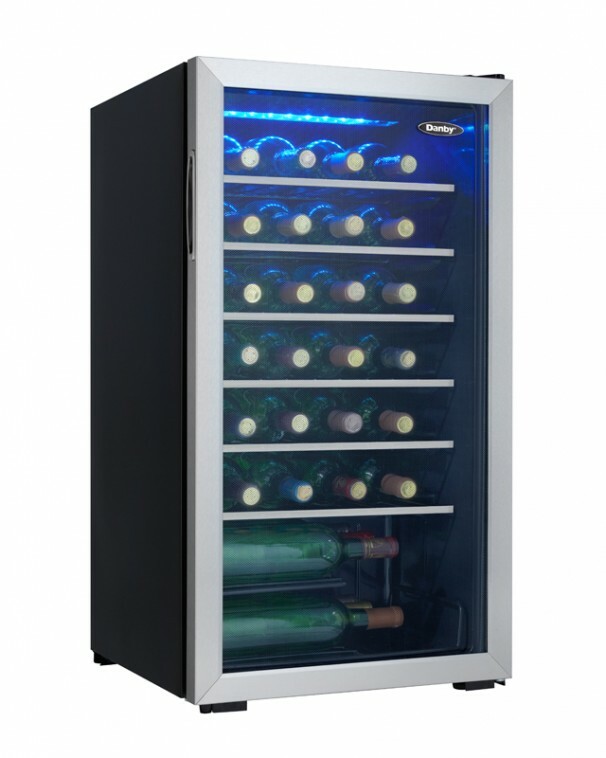 This trendy wine cooler features attractive black wire shelving along with a recessed pocket-style handle and a smooth back design. When reaching for your desired bottle of wine it won’t matter if you’re right or left-handed as the versatile door can easily and quickly be reversed. This cooler also offers in-home service on its 12-month parts and labour warranty.